Merente wood handled flogger (Turned by a member of our team) to our own unique, elegant and recognisable design, with a Bison leather hanging cord and quality gun metal screw fixed fitting. Falls are made from genuine high Grade Luxury Deep Grained Oxblood coloured American Bison leather (Also known as American Buffalo), a leather not easy to source in the UK. Falls are 10mm wide, 18 inches long, amount 27, and are bonded and screwed into the inner recess part of the wood handle securely. The Beautiful full tanned through oxblood coloured deep grained American Bison leather used in the falls of this flogger really is luxurious to see and feel, the leather is slightly spongy and fibrous and finished off with a glossed finish to enhance the attractive looking deep grain texture. 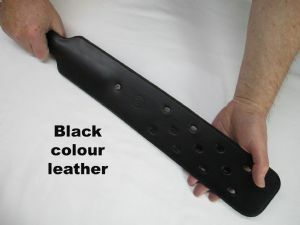 Due to the nature of difficulty in sourcing this exotic and luxury American Bison leather in the UK there have only been a very small limited amount of these floggers ever created by us, so this really is quite a unique flogger. We have now discontinued to stock Merente Wood Handles for our floggers. Each of our floggers is custom made individually in our Essex workshop by Master craftsmen and we are told that these are a very nice weighted flogger to use, which is quite thuddy to feel.